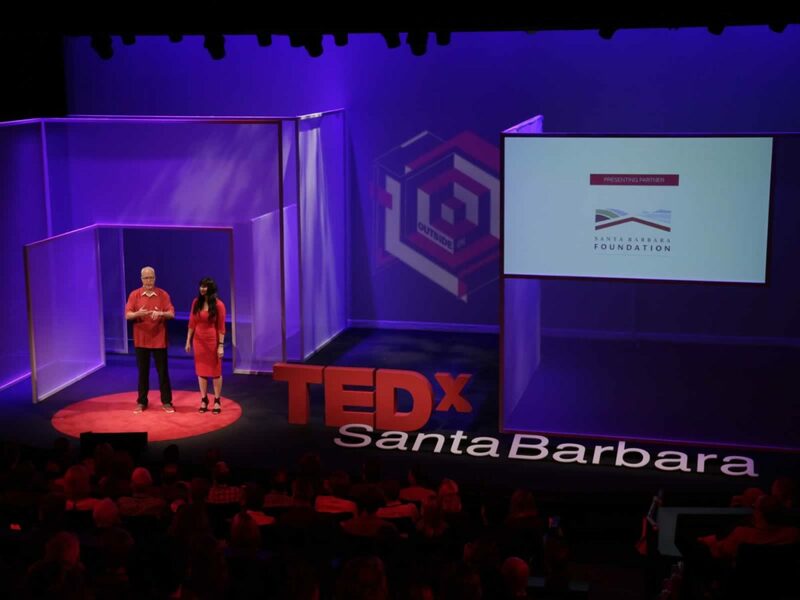 Mark Sylvester and Kymberlee Weil have been bringing TEDx to Santa Barbara since 2010. They started with TEDxAmericanRiviera on 10/10/10, produced it again in 2011 then again in 2012. After a couple of years off, they produced two TEDxLive events, rebranded the local event as TEDxSantaBarbara and relaunched in 2016. Mark and Kymberlee have a great story about how they met and created a project that debuted at TED2003, which led to a software company that is still Mark’s day job, in addition to podcasting. Kymberlee fell in love with helping people get their ideas out and onto the red circle and since 2010 has coached over 150 speakers, both for TEDxSantaBarbara and many TEDx events around the world. One of the great things about hosting this podcast as well as producing an event is that we’re able to share the best practices and fresh ideas we hear from others with our team, in real-time. As a result, we’ve added new experiences, team members and workflows to improve our event. Mark has been going to TED for over 20 years. Kymberlee started going to TED in 2003. The two of them have been to TED in Monterey, Long Beach, and Vancouver. They even spent their 10th Anniversary at the 2016 TEDSummit in Banff. Kymberlee has spoken twice at TEDUniversity and now is a fulltime TEDx Speaker Coach. Mark and Kymberlee met and started working together in 2002 to create a project for TED2003, and as she says, the addiction began. They were attendees every year at TED until 2009 when the opportunity to organize a TEDx was made available. They then produced three TEDxAmericanRiviera events. (This is the external brand Santa Barbara is known by.) Followed by two Live TEDx events and then two TEDxSantaBarbara events. Mark has also worked with TEDxSantaBarbaraYouth and Kymberlee has worked with many other TEDx events and TEDx speakers around the globe as a TEDx Speaker Coach. Mark and Kymberlee think of their event as a premium brand at every level – from the personal attention to every single attendee checking in to the nurturing of their speakers to the food selection and curation of the team itself. They aim to have a Santa Barbara feel to the event in the set design and there’s a good representation of local ideas with global appeal, as well as ideas from out of the area as well. For Kymberlee it’s Curating and Coaching. For Mark, it’s Organizing and Producing. The crazy things speakers will do. One decided to do pre-talk burpees in the stairway up to the stage and almost knocked himself out on the low ceiling. Another locked himself in his hotel room and said he wasn’t coming out. Ever. He did, eventually. Kymberlee says everyone keeps the non-speaking challenges away from her by saying, “You don’t need to know this – focus on the speakers.” This is true. She’s got to keep her calm and composure and steady state for the speakers. She’s the last person they see before going on stage. For Mark, this year was all about rebuilding the team and positioning the organization for growth. Finding the right people is always a challenge. From Kymberlee: Getting another batch of ideas out into the world. From Mark: Challenging the production design to do something radically different than we’ve done the past six years. Choose your speakers early and make sure your choices are grounded in the idea, not the personality. The sooner they’re in place, the easier it is for everyone.